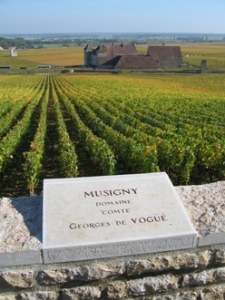 Comte Georges de Vogue is the largest estate in Chambolle Musigny, both in size and in reputation. The estate, after Romanée Conti probably the most famous from Burgundy, owns 7.2 hectares Musigny Grand Cru. This is almost 70% of the entire appellation! Even the other Grand Cru in Chambolle Musigny, Bonnes Mares, has a magnitude of 2.7 hectare estate vineyard. Within the Premier Cru they own 56 are of Amoureuses, but also Les Baudes and les Fuees, together good for 34 are. Finally, in the communal appellation, they have 1.8 hectares, all together 12.6 hectares. Since its origin around 1450, the Estate always remained within the same family, by inheritance or marriage, and so, after 5 centuries it’s at its 19th generation. Elizabeth, Baroness Bertrand de Ladoucette, took over the estate in 1987 after the death of her father Earl Georges. In this period some very important and, as will appear shortly thereafter, leading people have been recruited. 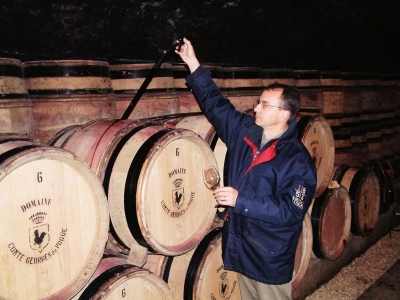 That is, Eric Bourgogne who is responsible for the vineyards, cellar master and oenologist François Millet and last but not least Jean-Luc Pepin as commercial manager. Together they managed in no time to produce wines of phenomenal quality and to restore the image of Vogüé to the same level as they were known for in the late 1940’s. Since 1990, the wines became truly spectacular. Such classic Burgundy’s demand at least 10 to 15 years maturity in a cellar. Because of the magnificent structure and concentration, which emphasize the enormous potential to preserve these wines, they resemble to a Bordeaux wine in their early stages. Obviously it is a matter of patience before the wines will reveal their phenomenal potential. These days the demand for certain wines exceed the availability and consequently these wines are being sold exclusively as futures only. Please contact us if you are interested in buying at first hand. We'll add your details to our database and contact you as soon as the new millésime is available. That same moment you'll get the possibility to buy the requested wines at very attractive prices.